This was my first attempt at making a savory galaxy-themed food. If you like galaxy-themed foods, check out my galaxy cake or my galaxy cupcakes. But if you prefer savory over sweet, this recipe makes dinner for 3-4 people. Cook ½ cup of forbidden black rice in 1 cup of filtered water. Cool to room temperature, covered. Boil the butterfly pea flowers in 1 cup of filtered water for 5 minutes. Strain the liquid so there are no flowers left in it. Cook ½ cup of white sushi rice in the blue flower-infused water. Cool the rice enough so you can touch it. Slice the cucumber and then punch out stars using a tiny cookie cutter. Divide the blue rice into 2 bowls. Mix a third of the sushi vinegar into one of the bowls of blue rice. Mix the rest of the vinegar into the black rice. Fill a new bowl half way with both shades of colored rice. 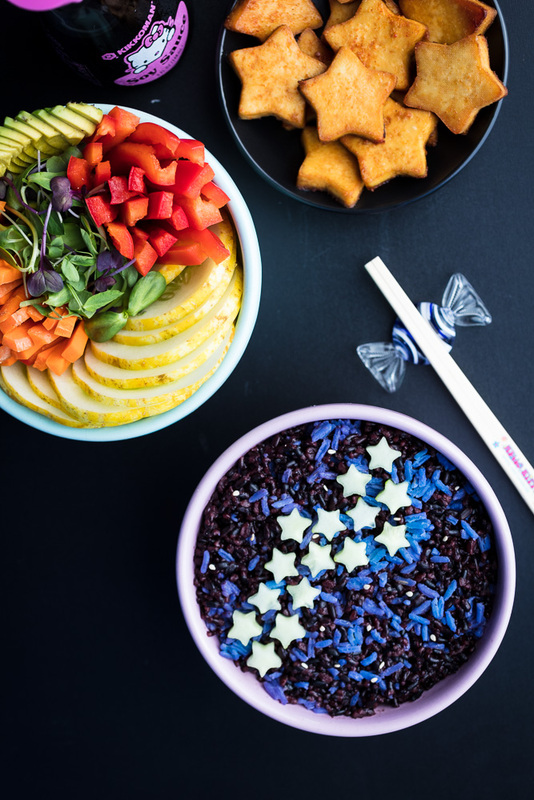 Top the bowl with black rice and use chopsticks or a utensil to mix the colors together. Sprinkle sesame seeds on top in any formation you prefer. Add the cucumber stars in the design you prefer. Slice the tofu block in ¼ inch thin slices. Wrap the tofu slices in a kitchen towel to wick away some of the moisture. Cut as many star shapes as you can out of the tofu slices and lay them gently into a greased lasagna pan. Lay the pieces that aren’t stars in there too. Brush all the tofu pieces with the marinade. I use a silicone brush like this one. Bake the tofu for 10 minutes, and remove from the oven. Flip each piece over and use the rest of the marinade to brush the other side. Bake the tofu for 10 more minutes, and remove from the oven. Serve the tofu stars with your galaxy sushi bowls, and save the remnants to eat in a salad the next day. 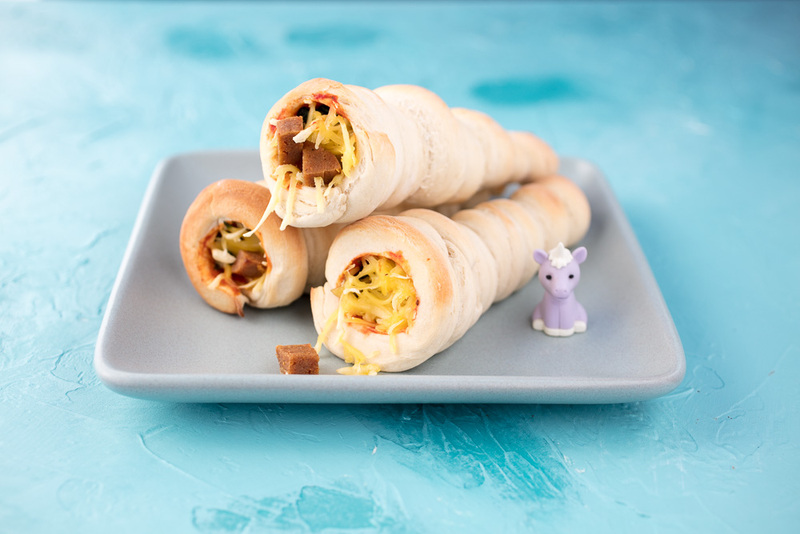 Slice an assortment of veggies to serve with your galaxy sushi bowls. I also served them with a side of seaweed and nama shoyu so we could make wraps. 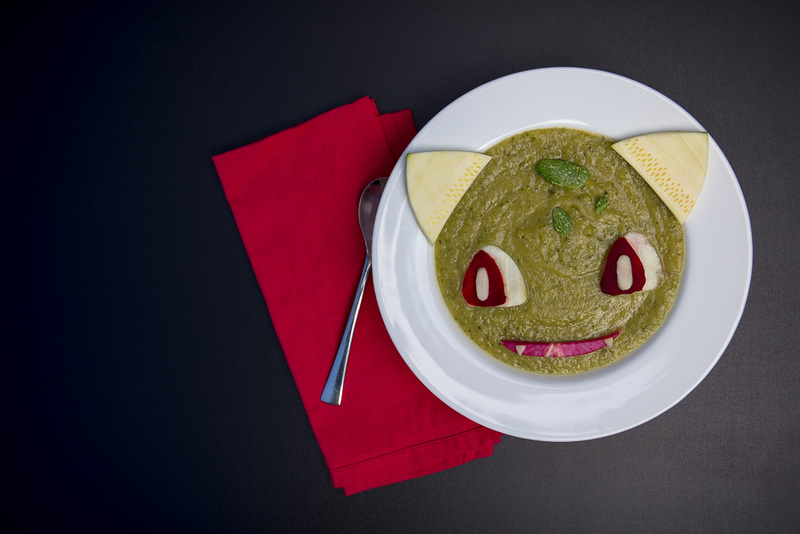 Also known as bulbasoup, this bulbasaur soup is perfect for summertime since it's made mostly with zucchini. Why should Burger King have all the fun? 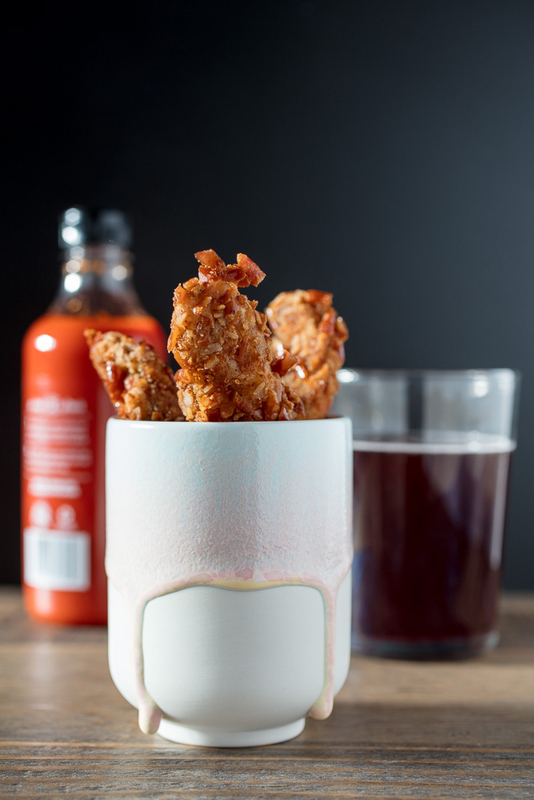 Here's a copycat vegan version of their newest limited-time menu item.